There is one small molecule that makes our world unique and special. What is it? Water! Sure, other planets and moons in our solar system may have (or had) water and even more than Earth, but it is rare to find liquid water on the surface of a planet (Kramer 2015, Wenz 2015). Let’s consider one of water’s well studied properties: density. The density of pure water can be precisely known to five decimal places as a function of temperature between 0 and 100 oC (Dean 1999). Water’s solid phase has a density that is less than the liquid phase. This is very normal to us since this is what makes ice cubes float! However, there are important chemical trends to understand that most materials go through as they transition from solid to liquid to gas phases. The typical density relationship between solid to liquid to gas is a fairly consistent decrease. Most substances show about a 1.2x (20%) decrease in density going from the solid to liquid phase with an additional 800x (80000%) decrease in density going from a liquid to a gas (Dean 1999, Lide 2003). This is easily explained by showing that the intermolecular distances increase with rising temperature. The expansion results from an increase in kinetic energy of the particles which overcomes the attractive intermolecular forces holding the shape and structure characteristic of each phase. This explanation works for most materials, except water and a few elements. I know of eight materials that exhibit an unusual density change going from a liquid to a solid in that the interatomic distance increases in the solid phase, i.e. the solid phase is less dense than the liquid phase! Seven out of eight materials are elements, or single atom type substances: Ga, Bi, Ge, Si, Pu, Sn & Sr. However, there exists one compound, which I have been able to find, that also fits this description: H2O. 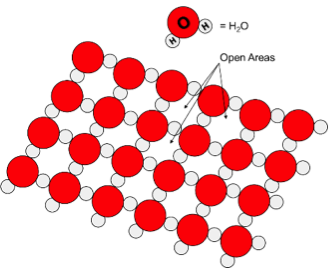 When water freezes, its volume expands by about 9% creating an airy, open lattice structure resulting from hydrogen bonding interactions between the oxygen of one molecule to the hydrogen atom of an adjacent one. This 9% expansion is higher than most of the eight other materials that have this same property. Other substances that have strong hydrogen bonding interactions, such as ammonia, acetic acetic, or hydrofluoric acid, do not exhibit this behavior. Other substances that are very polar like water also do not exhibit this behavior such as dimethylsulfoxide or formamide. There appears to be no other molecule that has this property. I have had students searching for a few years to find another COMPOUND that has the solid phase less dense than the liquid phase. Even with the motivation of extra credit, the search continues for another compound that behaves like water. Even if a few others are found, this property is very, very rare. It is amazing how normal this property is for us. Ice cubes float to the top of drinks; ponds and lakes form ice on the surface, and icebergs sail on the ocean surface. However, this is NOT the normal chemical behavior for most substances. Our everyday chemical experience is with the exceptional rather than the normal. It is hard for us to think of a floating ice cube as something unique, but it truly is. Another amazing property of water is that liquid water’s density increases as it cools and reaches a maximum density at 4oC. This gives the additional fortuitous property of cold water sinking as it gets colder, but to a point, then it becomes less dense and rises up. This temperature-density difference is responsible for creating the mixing effect that stirs the great bodies of water. Cold water falls to the bottom and helps push warm water to the top. This means that the whole body of water will need to cool down before ice forms in substantial amounts. This phenomena is a common experience for those of us living near the Great Lakes as we all wait to see when ice forms and if the whole lake will be ice covered. Floating ice helps protect aquatic creatures in the winter time. This is because ice also behaves as a decent thermal insulator which further thermally protects liquid water once an ice layer forms. If you are not convinced about ice’s capacity to hold heat (i.e. high heat capacity = good thermal insulator), please read about Frederic Tudor who was an American businessman and merchant who shipped ice all over the world. 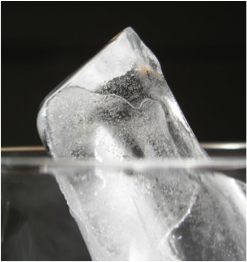 Ice can serve to protect life from thermal variations, but can also be a problem. Ice cover that lasts too long and is too extensive can lead to low dissolved oxygen levels resulting in huge numbers of fish dying, commonly referred to as “winterkills”. It would seem like water should get less and less dense as it cools, but the reality is just the opposite. If any of these properties were different, ice formation would be more prolific, and it would seal oxygen away and decrease light for plants to make oxygen in the water. Another nice thing about ice floating is that ice at the surface means it is warmed up first and melted as the temperature increases. This helps the solid phase to disappear quickly as opposed to accumulating on the bottom. Liquid water on the surface of a planet is a rare feat but having ice float on water is an even rarer chemical experience. The density of water and ice provide a unique relationship, between the solid and liquid phases of the same material, and this just so happen to be very supportive of life on planet Earth. Next time you see ice cubes floating in water, please pause and consider how unusual this experience is really supposed to be. Dean, J. A., Ed. (1999). Lange's Handbook of Chemistry, McGraw-Hill. Kramer, M. (2015). "Jupiter's Moon Ganymede Has a Salty Ocean with More Water than Earth ". Retrieved June 14, 2016, from http://www.space.com/28807-jupiter-moon-ganymede-salty-ocean.html. Lide, D. R., Ed. (2003). CRC Handbook of Chemistry and Physics. Boca Raton, Florida, CRC Press. Wenz, J. (2015). "23 Places We've Found Water in Our Solar System." Retrieved June 14, 2016, from http://www.popularmechanics.com/space/a14555/water-worlds-in-our-solar-system/.